A fresh Christmas wreath is an elegant, tasteful gift that spreads holiday cheer and wonderful fragrances throughout an office during the entire holiday season. 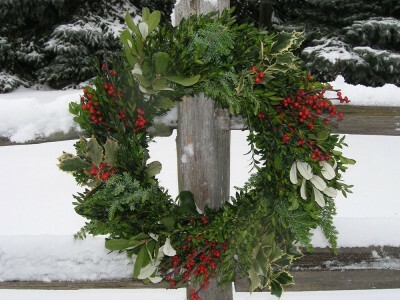 It exudes tradition and thoughtfulness, but it only takes you a few minutes to send a freshly made wreath on its way. The recipients will be impressed that you’re truly going green on your holiday gift list. Better yet, your gift is not imported. Rather than giving something made in China, you will be sending a wreath made in the United States, specifically, Michigan, from trees grown on our own farms. Ordering wreaths online also takes the hassle out of delivering them. Our staff at Christmas Farms makes the wreaths just before we ship them out via UPS so they arrive on a date you specify, fresh and fragrant. If you prefer, however, we can send the wreaths directly to you to hand out at the holiday office party or however you choose. How do you know the wreaths you order will arrive on time? We guarantee it. Hey, does Santa drop off some of his Christmas delivers a few days late? That’s a standard of delivery we strive to meet. What’s more, Premium Wreaths by Christmas Farms doesn’t offer generic wreaths you can find at your local big box store. Our Premium wreath are made from Balsam Fir, Boxwood, Douglas Fir, Fraser Fir, Fruit and Fir, Juniper Pepperberry, Magnolia, Cedar, Holly Berry, Winterberry, Oregonia, Canella, Concolor, and more, making your wreaths traditional, yet each wreath is unique. Give us a call today at 877-614-7180, or easier still, use our Group Order Address Template on our Corporate/Gift Order page. Copy your list of names and addresses onto the spreadsheet form for those who will receive wreaths, then email the list to us at the address you’ll find on the form. This year, make your business gift giving thoughtful, traditional … and non-fattening.